If you saw a presentation you like in the public presentations stock of Emaze, and you want to use this presentation in order to create a similar presentation of yours, all what you need to do is to click on the small icon from the left bottom side in order to duplicate the presentation, to click again on ‘duplicate’ in order to copy the presentation to your presentations library and then you can edit the presentation how much you want, but you need to validate that you don’t violate copyrights. You have old PowerPoint presentations that are lying in your computer and you want to make them alive? 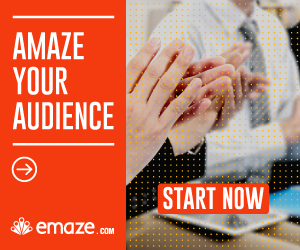 With the system of Emaze you will can, easily, to make your PowerPoint presentations to designed Emaze presentations. In order to add more liveliness to your presentation, it’s recommended to add audio files that will make your presentation to more attractive and interesting. You can add audio files to every presentation, like songs, narration, sound and more. Click on “media” and upload an audio file or paste a link from the internet and then you’ll be able to modify start & end time, automatic play, loop play and more. In order to give the elements 3D look, click on the desired element. On the toolbar that just opened click on the 3D icon and then you’ll turn your element to the whole sides in order to give it a 3D look. In Emaze presentations, you can animate elements like texts and photos. Click on the element that you want to animate, on the toolbar that just opened click on the effects icon and then choose the type of animation. Sometimes we need to put a link of an external web page in our presentation, whether if it’s for contacting information sources, and whether if it’s for other things. You can link every element to an external web page. Click on the desired element, then click on the icon of the link and put the website link of the external webpage you want to link to your text.